After a week of unseasonably warm weather which melted a lot of snow and gave us all hope that spring might show her face almost a month early, winter has blasted back in to finish things up. It seemed like the perfect time to whip out a knit I promised Max months ago. We were out at a restaurant after their bedtime (so the kids were already a bit cranky) when this Chilean woman came in. She set up a little table by the door and spread out a rainbow of colorful hats, scarves and sweaters. Bright, bold primaries in stripes and patterns, beautifully knit from (not wool, but) llama and then brought over to Japan, where apparently she can turn quite a profit. I took Max over to the table both to distract him and to have a better look myself; he was entranced. He sat on my lap and stared at the colors, and begged me to buy him a hat. I actually thought about it, but we didn’t have enough cash on us. I told him we didn’t have enough money, and he said we should go get money from Daddy, who (obviously) could just take some out of his pocket and buy the hat. When I told him we couldn’t buy it, Max cried. He cried, and cried, and cried, and would not be consoled until I promised that I would make him a triangle hat in lots of colors with my yarn. I ordered the yarn the next week. Unfortunately, between ordering the yarn and when it arrived, other projects had come up, so it’s taken a long time for me to make Max’s hat. He’s got it now, though, and both of my boys are pleased. Not particularly creative, but then, it’s not intended to be. (There’s a huge bunny sign out by the street, as well.) 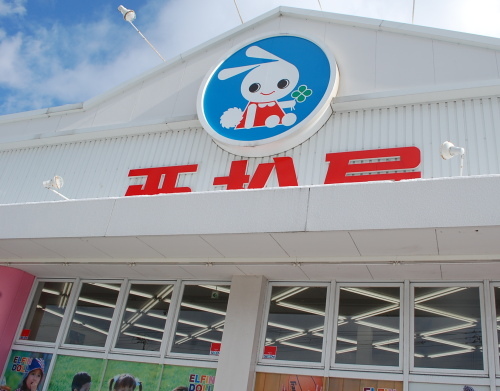 It has a real name, and those who read Japanese better than I refer to it by that name, but for ease of recognition most Americans just call it the Bunny Store. It’s a children’s clothing store, and they have some of the most adorable little outfits in there that you have ever seen. Sadly my boys have moved out of the ‘adorable little clothing’ sizes and most of what’s available for them is ‘little man’ clothing, but I keep meaning to buy them a few shirts there. 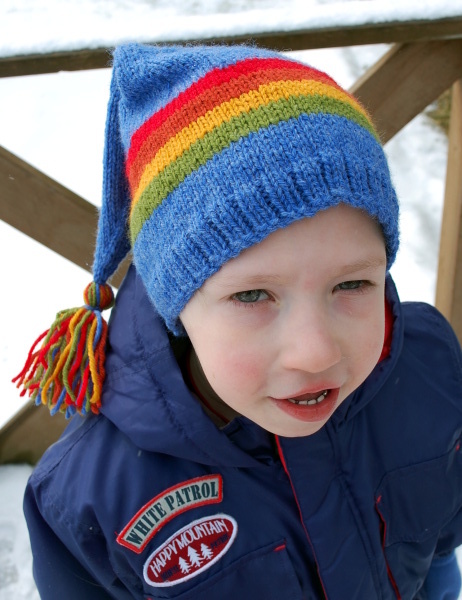 At any rate, I plan to make the patterns for the boys’ hats available a little later, so if you like them keep an eye out for that! This entry was posted in Cultural Experiences, Finished, Life in General. Little man clothing is cute in it’s own right. White Patrol though–that cracks me up! I love the hat! Don’t you love having the skill to recreate their “must haves”? Their hats make me feel so happy. Love all the bright colors. 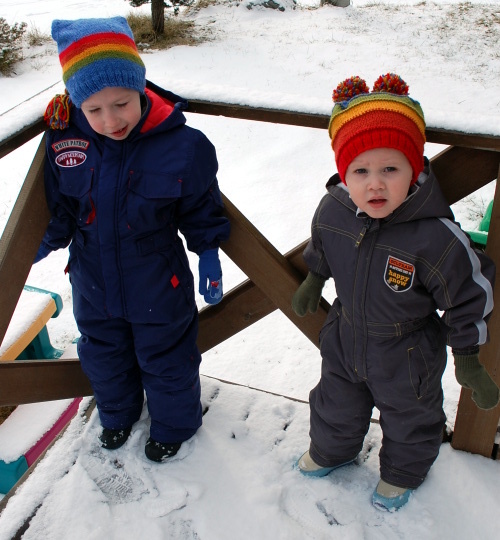 Awesome snowsuits. I wish I could find a whole suit for my girls, it would make life easier.